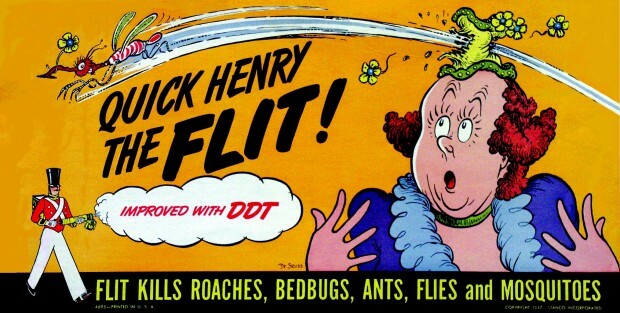 Advertisment campaign for Flit insecticide "Improved with DDT." The years after the Second World War were prosperous ones for American businesses. With ever-greater profits and international power, there seemed no limits on the potential for domestic growth. This coincided with prevailing views of the natural world as something to be conquered and exploited for the betterment of society. It was in this favorable business climate that Monsanto, Ciba, and other chemical companies produced Dichlorodiphenyltrichloroethane, or DDT, for widespread use as an insecticide to promote the growth of the nation’s agricultural business. In the late 1940s, however, a Westport physician by the name of Morton Biskind began noticing new ailments (and new variations on old ailments) in the people he treated, as well as in domestic animals and wildlife. The maladies he observed initially proved most pronounced in dogs, cats, sheep, and cattle and included degenerative problems in their brains, internal organs, and muscles. Biskind, Bieber, and others alarmed by the effects of DDT bucked the status quo. Just one year before Biskind and Bieber published their article, Swiss chemist Paul Hermann Muller won the 1948 Nobel Prize in Physiology or Medicine for discovering the effectiveness of DDT against yellow fever and malaria. 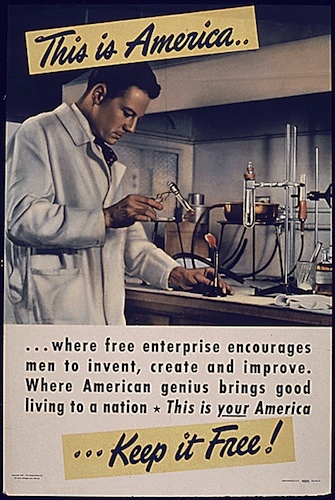 Chemical giants such as DuPont and Geigy manufactured large quantities of the insecticide for use during World War II and government regulators (such as those at the Food and Drug Administration) dismissed Biskind’s claims. In reality, it was already well known among scientists that DDT had a devastating impact on life forms beyond the insects its manufacturers intended it to kill. In addition to the humans and mammals Biskind observed in and around Westport, virtually every kind of fish, bird, animal, and insect exposed even to small doses of DDT suffered adverse health consequences. Though largely ignored (and sometimes reviled), Biskind continued to spread his message of warning. In 1950, he testified before Congress about the harmful effects of DDT, and in 1953, he published another important article, “Public Health Aspects of the New Insecticides,” in the American Journal of Digestive Diseases. Though resistance from powerful quarters continued, the message began to get through. More and more studies showed the destructive impact DDT spraying had on all forms of wildlife, as well as its direct links to cancer and other diseases in humans. It was in the 1960s that the work Biskind accomplished actually bore fruit, as others, such as biologist Paul Shepard, carried forward his efforts. Most famous among those inspired by Biskind was Rachel Carson, a marine biologist who in 1962 authored Silent Spring, a landmark in environmental literature. Five years later, in 1967, a group of scientists and lawyers formed the Environmental Defense Fund for the express purpose of banning the production and use of DDT. 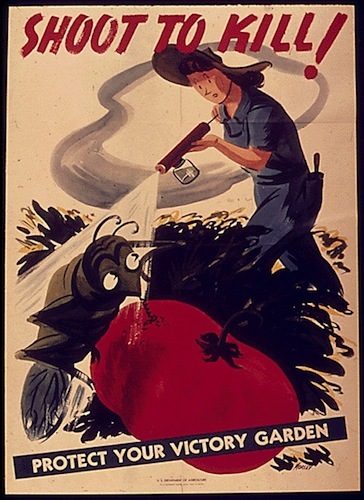 In 1968, Hungary became the first nation to ban DDT for agricultural use and other countries soon followed—the United States banning DDT in 1972. In response, DDT manufacturers sued the Environmental Protection Agency. Authorities eventually upheld the ban, however, and DDT has ever since only been authorized for use in extreme cases (such as when facing possible threats from fleas spreading bubonic plague or mosquitoes spreading yellow fever). Morton Biskind died in 1981 at the age of 74. His work, however, continues to live on—celebrated by environmentalists around the world, as well as by such influential public health advocates and writers as E. G. Vallianatos. Wickenden, Leonard. Our Daily Poison; the Effects of DDT, Fluorides, Hormones and Other Chemicals on Modern Man. New York, NY: Devin-Adair, 1955. Vallianatos, E. G., and McKay Jenkins. Poison Spring: The Secret History of Pollution and the EPA. New York, NY: Bloomsbury Press, 2014. Biskind, Morton S., and Irving Bieber. “DDT Poisoning – A New Syndrome With Neuropsychiatric Manifestations.” American Journal of Psychotherapy, 1949, 261. Biskind, Morton S. “Public Health Aspects of the New Insecticides.” American Journal of Digestive Diseases 20, no. 11 (1953): 331–41.